Liberty Township trustees officially accepted the “verbal resignation” Monday of the Zoning Supervisor James Cirigliano. Cirigliano tendered his resignation Oct. 31 during a special session of the trustees. Cirigliano, not satisfied with the board’s explanation of why the township picks up the statutorily required contribution to the Ohio Public Employees Retirement System for some of its employees and not others, said, “I quit,” and left the room during the Oct. 31 meeting. According to section two of resolution 17-1031-03, the pickup is limited to the part-time administrative assistant/HR specialist, all full-time employees hired prior to Nov. 1, 2017, and full-time employees covered by the United Steel Workers collective bargaining agreement. The exceptions listed in the section are the township administrator, zoning inspector, zoning supervisor, parks supervisor, parks and road services office manager. Trustees scheduled a public hearing for Monday, Dec. 4, at 7 p.m. to rezone the property at 10613 Sawmill Road, Powell, from Farm Residential to a Planned Multi-Family Residents District. The request for the zoning change was submitted by Epcon Communities on the behalf of Renee Dublar and Dwight Ladd. The request to rezone the 1.28 acres located within the township is for the construction of five additional units for a proposed expansion of the Courtyards at Bradford Court. 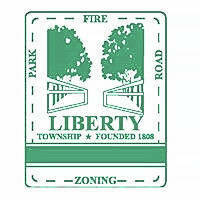 Liberty Township’s Zoning Commission approved the preliminary and final development plan application by a 5-1 vote. Trustees authorized a request for engineering assistance from the Delaware County Engineer’s Office for a sight line/obstruction study at Bean-Oller Road and Liberty Road. Trustee Tom Mitchell said he has visited the intersection and agreed with having the study done by the county engineer. Trustees approved a storm sewer maintenance agreement with the City of Powell for Hunter’s Bend. The sewer crosses the boundaries of both Powell and the township. “It’s a storm sewer we won’t have to maintain,” said Matt Huffman, township administrator. Trustees approved a resolution changing the process and procedure in the employee injury leave policy. According to the approved resolution, the change “will ensure the policy will be “administered consistently” throughout the township. Cathy Buehrer, administrative assistant, said the change had the blessing of the local International Association of Fire Fighters union, but she had not heard back from the United Steel Workers union. Beuhrer said it was a change she had started working on with Chief William Fields, interim fire chief, and finalized with Fire Chief Tom O’Brien.